Here is Stephen Kessler’s obit for George Hitchcock, as published yesterday in SantaCruz.com. When I was an undergraduate and aspiring poet at school in upstate New York in the mid-1960s I started reading the small-circulation independent literary journals known as little magazines. It was a volatile historical moment when cultural life was starting to erupt in all sorts of unpredictable forms, and one of those forms was this suddenly dynamic proliferation of creative periodicals run by eccentric individuals with a taste for poetry and some esthetic agenda or political viewpoint to promulgate, and read by a self-selected bohemian elite. One such journal was the San Francisco quarterly kayak, a remarkably lively magazine launched in 1964 and publishing some of the best poets, both famed and unknown, then writing in the United States. The editor and publisher of kayak was someone named George Hitchcock. Like pretty much every other anti-Establishment poet in the country, I wanted to be in kayak, so I started submitting my poems—and promptly receiving them back along with shockingly irreverent rejection slips with deadpan regrets from the editor accompanied by a comical collage or illustration clipped from some 19th-century picture book featuring a man falling into a hole or being devoured by wolves or shot by a firing squad or suffering some other unfortunate fate. These rejections, in addition to being amazingly quick and thus sparing you the agony of suspense, had a lighthearted “tough luck” in the subtext—none of those “we-found-much-to-admire-in-your-work-but-due-to-the-large-volume-of-submissions . . . and-good-luck-placing-it-elsewhere” notes more typical of today’s creative-writing-program-based reviews. No niceness or phony encouragement tainted kayak’s forthright rejections with insincerity. When I returned to California for graduate school at UC-Santa Cruz in 1968 I met George Hitchcock at a small gathering at the home of poet Morton Marcus, who had also moved there that year to teach at Cabrillo College. As destiny would have it, Hitchcock moved to Santa Cruz the following year to teach writing and theater at UCSC’s new College V, whose academic theme was to be the arts. While continuing to collect rejections from kayak I gradually, in the course of occasional encounters, began to get to know its humorously grumpy editor. Near the end of my career in grad school, before flipping out and dropping out, I took George’s poetry workshop, and when the term was over he invited me to serve as his teaching assistant next quarter in improvisational acting. This seemed to me very strange, as I had zero experience in theater, but evidently the teacher detected something in my poems or personality that he thought would enable me to improvise the role of his TA. It was the best advice I ever received. In those days before the MFA industry and Garrison Keillor made poetry a respectable occupation, to decide you wanted to be a poet was not a plausible career move. You were dooming yourself to a life at the edge of eerything, with neither a guaranteed income nor any sign of societal acceptance. Hitchcock, with his own anti-academic history and a brief career in progress as an accidental professor, apparently had concluded that, at least for someone like me, unemployability was a better bet than professorhood. Eventually my poems made it into the pages of kayak, and in 1975 George published my first book. The kayak imprint was a great endorsement, and though the book received mixed reviews, it did get reviewed, and at the premature age of 28 I was launched as an author. Hitchcock, in his gruff and subtle way, had given my so-called career a supportive shove. I wasn’t the only poet, young or mature, for whom George had played such a role. Over the next several years I would meet many of them in the community that grew out of kayak, both in its pages and in the legendary collating parties where the magazine was physically put together. Three or four times a year, on a Sunday afternoon, dozens of poets and friends of kayak would gather at George’s house in Santa Cruz to collate, staple, stuff, stamp and send out the latest issue. George—a skilled printer, among his other crafts and arts—by then had printed the pages himself on a press in the shop on his property, and the issue would be assembled by his crew of helpers, whom he and his partner, Marjorie Simon, would supply with platters of cold cuts and plenty of beverages. It made for delightful social life—many good friendships and collegial acquaintances were initiated—and efficiently accomplished the mission of putting out the magazine. George was the director of this operation, positioning people on the assembly line and instructing them on procedures (if this was their first time) but otherwise assuming as low a profile as his leonine 6-foot-4 physique would allow. He ran things in a way that enabled his helpers to run themselves. His poetry workshops worked much the same way. George rarely commented on students’ writing, rather allowing participants to read and remark on one another’s efforts. He didn’t assert authority or try to push the poets in one direction or another, instead just listening attentively, sometimes making a brief comment, or starting an exercise with some object he would pass around the room—in his apartment at College V in the workshop I took with him in 1969, later in his living room in Bonny Doon or in the big Victorian on Ocean View in Santa Cruz—and turning the writers loose to riff associatively, giving free rein to their imaginations. It was imagination that he valued above all—not autobiography or sentiment or noble thoughts or “spirituality”—but a sense of invention, discovery, astonishment and wit. In criticism, intellectual honesty was paramount. kayak ran from 1964 to 1984, a total of 64 issues, and that was that. George, as self-described “dictator” of the enterprise, was ready to move on to other things—more of his own writing, visual art, teaching, acting, directing, traveling. He’d been a merchant seaman, a labor organizer, a gardener, an actor, a novelist, an investor (municipal bonds, he once counseled me, were the best place to put your money), a poet, someone you couldn’t easily pin down with a limiting definition. After the earthquake of 1989 he and Marjorie left Santa Cruz and returned to his native Oregon, where he continued with his various activities, spending winters in La Paz, at the tip of Baja, where George, as “Jorge Hitchcock,” frequently showed his whimsical, surrealish, sophisticated, mordant, quasi-primitive paintings and collages in local galleries. George Hitchcock died at his home in Eugene on the night of Aug. 27. He was 96 years old and had lived an extraordinarily creative and fully realized life. 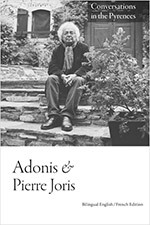 He was an influential teacher, more by example than direct instruction, to many other writers and editors, including this one, and a legendary figure in the literary culture of the ‘60s through the ’80s—a model of independence, ethics and integrity—without ever making a spectacle of himself or trying to play the role of anyone’s guru. He didn’t like to be the center of attention but enjoyed providing a setting for others to interact and flourish. kayak was both a highly individual vehicle, a “one-man boat” piloted by the editor’s singular vision, and a community effort created at his famous Sunday get-togethers. At a time when the academic formalist model was fading as a viable style for contemporary poetry, and the New York School and Black Mountain poets and the Beat movement were on the rise, George took kayak in its own unique direction, cultivating an imagistic, surrealist, non-doctrinaire, irreverent, often political, sometimes polemical sensibility, and publishing a range of poets from W. S. Merwin and Raymond Carver and Michael McClure to Robert Bly and Gary Snyder and Philip Levine, as well as many lesser-known bards like me. The magazine also printed letters and George’s collage illustrations—always provocative and amusing—and had a section for criticism where I published my first book reviews. It was easily one of the most vital publications of that or any era in American poetry. But his post-kayak years were at least as fertile, with a prolific output of art and a continuing creative evolution as an all-around man of culture who proceeded on his own path while also encouraging others—for example, endowing a poetry fund at UCSC for nurturing the art and its writers through readings and other programs. His personal style, in the years I knew him, tended to tweed jackets, sometimes a cape, paisley ascots, rakish hats (often with a feather in the hatband), a pipe, a walking stick—a somewhat Oscar Wildean figure of anachronistic fashion—and a resonant tenor voice that bespoke his stage experience. He liked to dress up in a scary costume on Halloween and give the trick-or-treaters the fright of their night. The Day of the Dead, with its dancing skeletons and festive celebrations of the departed, was a holiday suited to his darkly comic temperament. He hitched his kayak to a star and blazed a long bright streak across the sky. Thank you for your mention of George Hitchcock on your site. As a former student of his, it makes me so happy to see him remembered and appreciated for the amazing person he was. We loved Jorge and Marjorie very dearly. Petra & Jens, I am working on an event in honor of George Hitchcock and would love to have a copy of your photo of him from La Paz. Our website should be up soon — http://www.kayakattheconfluence.org. Could you get in touch with me?